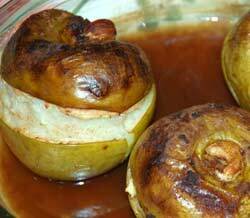 Juicy apples baked with a rum and cashew nuts. A great simple recipe for cold winter days. 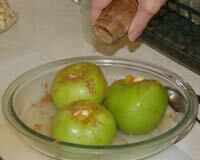 Use an apple corer to remove the core from each apple. I you don't have a corer then you can cut carefully with a knife, but it is much harder. Using a knife cut a skin deep horizontal line around the outside of the apples. This is to allow room for the inside apple to expand. Try not to join your cut all the way around to reduce the chance of loosing the top half. Place the apples in an oven proof dish and stuff them with apricots and cashew nuts. Pour a shot of rum over each apple then sprinkle generously with cinnamon. 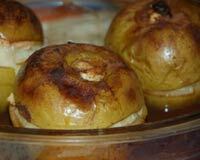 Cook in a preheated oven at 190°C/380°F/Gas Mark 5 for 45 minutes or until the apples are soft. Serve with low fat yogurt.